Tom Russell always keeps his listeners alert. Whether through conquering the art of storytelling via music; filling an empty canvas with a literal style of writing or penning a memorable song, his lengthy career has left a catalogue of folk records covering a broad range of subjects. This has led to him being actively thought of as a scribe of Americana, the wider definition of the underbelly of a continent rather than a pre-described music style. While FOLK HOTEL is quintessential Tom Russell, the subjects frequently span the landmasses of America and Europe with the usual combination of viewing the macro of the landscape mixed with the micro of the individual. Weighing in at fourteen tracks (seventy-one minutes) for the essential deluxe physical version, the new record joins the club of Russell’s more time friendly releases as opposed to the epic that unravelled in his last major project THE ROSE OF ROSCRAE. Since this double album crashed onto the scene like an Alpine avalanche, Tom Russell did partake in another project celebrating the songs of Ian and Sylvia Tyson. Indeed Ian Tyson, an elder statesman of Canadian folk, country and western music, is the subject of ‘I’ll Never Lose These Horses’ on FOLK HOTEL and joins Dylan Thomas, JFK, Hank and Lightin’ Hopkins as significant historical figures to pose as writing topics for Russell. While the laid back and accessible performing style of Russell smooths the path of his music to the listener’s ear, grasping the true depth of the record requires a great deal of dedication; one that will excite his aficionados and present a challenge to newbies. However, this is a challenge rewarding perseverance with a treasure chest of contemporary folk music designed to fascinate generations for years to come. Like his previous work, an accompanying book is being made available to give further insight into the extensive material that forms FOLK HOTEL. This does extend the choice to how deep you want to immerse into the music of Tom Russell and the wide detail of his influences. While this was not available during the formal review process, it would have only led to a proliferation of the writing task and the ultimate straying into essay territory. With or without the book, a finger on the search field of a device is not unknown when listening intensely to the lyrics of Tom Russell. This is when the inevitable desire to expand the education process prevails. On the surface, FOLK HOTEL takes you on a geographical voyage almost splitting its time between Europe and America. The former, a valuable supporter of Tom Russell’s music over the years, takes shape in ‘The Sparrow of Swansea’ (a co-write with Katy Moffatt celebrating the enigma that is DylanThomas). This is closely followed by ‘All on a Belfast Morning’ and later on the record with ‘The Rooftops of Copenhagen’. Both these tracks possess the trademark Tom Russell spoken parts with prose from Irish writer James Cousins credited in the first one. The album begins with three tracks firmly planted in Russell’s homeland. The song dedicated to Ian Tyson has been previously mentioned and this is preceded by one of the record’s standout tracks ‘Leaving El Paso’. His previous work tackling the landscape and people of the West has been amongst Russell’s best (most notably ‘Guadalupe’) and now you can add this accordion drenched piece skirting the Mexican border. 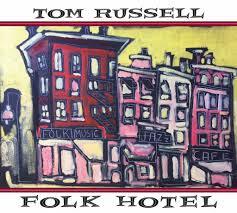 ‘Up in the Old Hotel’ opens the record in the famous Chelsea Hotel in New York City and in four precious minutes lets you know that you are firmly hooked into another Tom Russell album. Sparring with the border song for the standout moment are two tracks at the core of the record. ‘Rise Again, Handsome Johnny’ weaves the known and the unknown into the true story of a meeting with John F. Kennedy, while wrapped into an easy listening beat. ‘The Last Time I Saw Hank’ probably takes the writing into a more metaphorical direction with a message of pondering some of life’s poignant moments delivered in a very Johnny Cash style. Before documenting the remaining tracks on the main body of the album, let’s turn to the two songs that provide the value of the deluxe version. These add a total of fifteen extra minutes for your outlay and start with Tom Russell in cover mode. He has never hidden his admiration for Bob Dylan (ok not an earth shattering revelation) and teams up with Joe Ely for a version of ‘Just Like Tom Thumb’s Blues’. A nine-minute epic ‘Scars on his Ankles’ closes the record detailing the life of legendary blues performer Lightnin’ Hopkins. This references many aspects of the subject’s life including the penal remnants and also includes more of the part spoken/part sung style. This style is also prevalent in track eleven, which rolls out as a three-in-one presentation titled ‘They Day They Dredged the Liffey / The Banks of the Montauk / The Road to Santa Fe-O’. In effect, presented as three separate one-minute sample pieces. The remaining songs, ‘The Light Beyond the Coyote Fence’ and ‘The Dram House in Gutter Lane’, are more conventional offerings with the former taking stock of life on the road and the latter immersing itself into 16th Century slang. ‘Harlan Clancy’ brings a close to this exceedingly brief dive into the deep well of FOLK HOTEL with American musician Augie Meyers delivering the opening before Tom Russel takes over the reins with the remainder of yet another story. Any perceived exhausting elements to grasping the underpinning value of a Tom Russell album are blown away by the riches that this influential Americana scribe lays out. FOLK HOTEL will keep a listener on their toes and retains a tendency to reveal a little bit more in each play. This is the fruit of a legendary singer-songwriter at work and every small share keeps the spirit alive. In a JFK twist – ask not what Tom Russell can do for you, but what you can do for Tom Russell. There is a promotional video widely available on the Internet supporting this album detailing Tom's take on its making and influences. Feel free to check that out, but to accompany this Tom Russell piece, I couldn't resist sharing the prophetic classic from 2007.